As we approach the New Year (2010 – can you believe it!! ), many sellers are doing their end of year inventory clearances and determining their selling strategy for 2010. Vendio offers choices in how you handle inventory between markets and I wanted to take some of your time and look at those choices in depth. Because Sales Manager is such a powerful application, you can make your inventory choices on an item level, which really means that you do not have to choose how your inventory is handled globally and apply it to all items, but you can choose to set how you handle your inventory on an item by item basis. So, what really happens with these choices and when should they be used? Generally, if you have a one-of-a-kind item, you’ll want to use Do Not Allow Overselling. 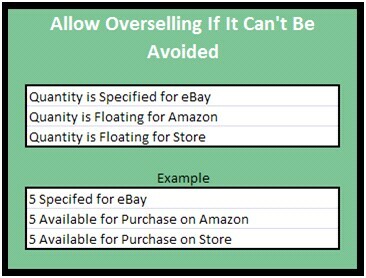 When Do Not Allow Overselling is selected items are committed to eBay and to Amazon. If you have a Vendio store any available items (not committed items) can be sold. In the above chart, using 10 items, we’ve specified 5 for sale on eBay and 2 on Amazon, which allows the remaining 3 to be sold in your Vendio store. Allow Overselling if it can’t be avoided apply mainly to Amazon and your Vendio store. eBay items are committed (If you list 5 on eBay, these cannot be sold elsewhere). This option is generally used when you have a limited quantity, are selling on Amazon and in your Vendio store. In the above example, we are using a quantity of 10. Thus, if I have 10 items in stock, and have committed 5 to eBay, I have 5 remaining that can be purchased EITHER from Amazon or Vendio Store. 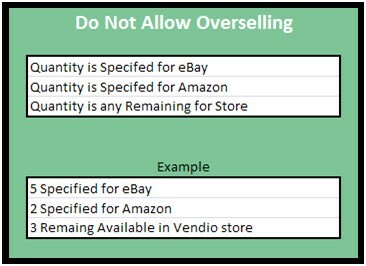 While it is unlikely that someone will purchase all 5 from Amazon and all 5 from your Vendio store at the same time, it could occur leading to a situation where you have oversold your product and will need to cancel one of the orders. This is actually a pretty safe way of having your products on multiple markets even though there may be a time where you oversell; it again, is pretty unlikely. Vendio will adjust the quantities “available” for Amazon or your Vendio store, thus if a buyer purchases 1 on your Vendio Store,. the new available for purchase amount in this example would be 4. Generally, this option is used if you have (or can get) an unlimited quantity of an item. Item quantities are still specified and committed to the eBay Marketplace, but with this setting a buyer can purchase an unlimited quantity from Amazon or your Vendio store. In the above example, we have listed 5 on eBay. Amazon and your Vendio Store have unlimited quantities. We hope that the above assists you in choosing the right inventory setting for your items and we wish you much success in the coming New Year! This entry was posted on Monday, December 28th, 2009 at 9:45 am	and is filed under Vendio Applications. You can follow any responses to this entry through the RSS 2.0 feed. Both comments and pings are currently closed. Very good information, to be serious, I did never take this into account, now I will put more attention to this detail.